Another teaser for Time Machine has just released! Let’s just say it’s time to get excited (terrible pun). Recently another teaser has been released which shows more scenes of the girls in the MV. So far it doesn’t actually seem like any of their stories are connected, but this teaser already has SONEs buzzing. Click Play to see why. ‘Time Machine’ comes straight off of Girls’ Generation’s repackaged Japanese Album, ‘The Boys’. The first teaser showed a Japanese actor crying about the memories of a distant past and left much to be desired but also peaked our curiosity. We reported earlier that it looked like the girls would be doing their first ‘Story MV’ (about time!) because of this little 30 second clip featuring the actor (he ain’t no future EXO member that’s for sure, aka the guy in the Japanese Genie PV). It appears our hunch may be right as the latest teaser shows the girls acting in some rather dramatic environments. There’s already a ton of buzz on Twitter/Tumblr about this new ‘Time Machine ‘PV/MV that is definitely worth a good look over. According to Girls’ Generation’s Japanese Facebook the MV will be released on March 13, 2012 in Japan. If you have not watched the teaser, Please watch it before reading my thoughts/summary of the teaser below. Inside the short minute and 44 second video, the girls all have their own unique scenes and obviously the theme of time is prominent. Since it’s one of my favourite SNSD songs, I decided to dive into the teaser and share some thoughts and things I noticed. Yoona (Day) – Walking along a pathway in the snow, but it must not be cold because nobody is really wearing any laters. Again, she’s looking rather amazing in another full dress (like The Boys) but it’s interesting to note that this one looks more like a wedding gown. The concept of time is less prominent in her scene than the others. Taeyeon (Day) – Our lovely leader is actually seen basking in the daylight (Goddess of the Sun lol). It’s hard to tell whether she’s waiting for someone or deciding whether or not to go somewhere since she isn’t leaning on the wall and has body language that suggests ‘movement’. Again no real concept of time, and the scene ends with her staring at the sky. Sunny (Night) – She checks her watch (time not distinguishable) in the middle of one heck of a rainstorm (get into some shelter!). This element is similiar to Yoona’s in a way and may be a theme within the story. By far the thing that stands out in this scene is her outfit which is glittery and almost futuristic. Even her watch seems unique in appearance. Time Traveller?! 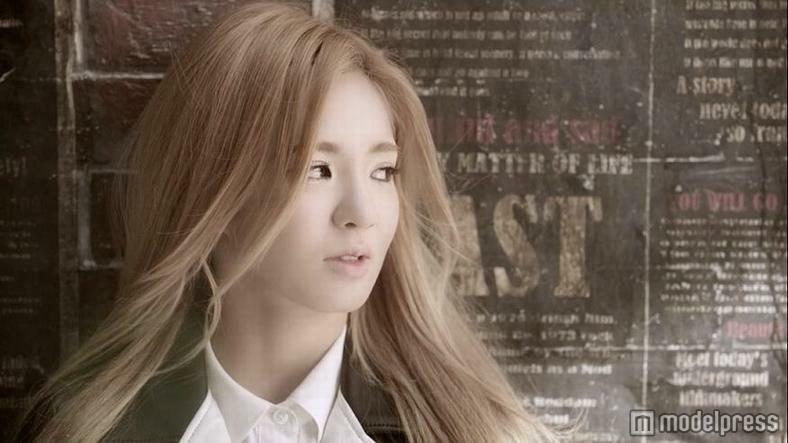 Hyoyeon (Day) – Also waiting for someone in what appears to be an alley with her hands in her pockets anxiously. Checks her watch (time cannot be distinguished). Her outfit does not look dated by any means (unlike Seohyun). Yuri (Night) – Checks the time on her phone which reads 2:02 (horse background?). The girl is either waiting or missing someone judging by the tortured expression on her face and the phone held tightly in her hands. Surrounding her are a bunch of balloons and streamers, so clearly something worth celebrating had happened. Jessica (Night) – Waiting in a Maybach car (baller), checking out the time. She writes something on the moisture that has built up on the car window. It’s cursive and I can’t seem to distinguish the first letter, but ys follow it. Seohyun (Day) – Really bright, elegant setting. Note the design of the clock which suggests a different time period. It reads 4:10. Curiously, she’s looking at what is either a photo or a letter. So all-in-all, I only really see aconnection with Sooyoung and Yuri (SooRi?) and the rest are just observations. Here are some photos from the teaser below. Of course, the MV/PV might be totally different and they might not interact with one another at all. Nice job! Can’t wait to see where this goes! can’t wait for the full PV! it says video is private? how do you see it? lol,the video is private,is there any link probably from Meta or else?? do they perform “bad girl” live any longer? Non-private copies are out there; for example: http://www.youtube.com/watch?v=WCC2r-51Po8. If that goes down, I found the best search to be: 少女時代 Time Machine PV 1:44.
the girls are dazzled with beauty, i have no words left to describe it. Oh, I’m Loving this already 😆 ! It’s good to see another MV/PV from our talented 9 ladies again :), and especially one based on such a Great song (one of my favourites from the album actually ;)). increible!! !….YOONA IS A GODDESS :)….she is perfect. Why doesn’t have yoona’ sing part?